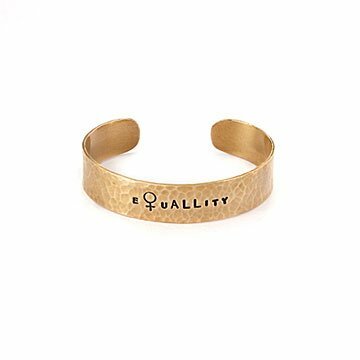 A simple cuff with a meaningful message—that everyone deserves equality. Now more than ever, it's important to show what we stand for—and often, simple messages carry the most weight. Wear your true heart on your sleeve with Amy Waltz's bold, red brass cuff. She casts each character of the powerful sentiment individually, and hand-hammers the piece to create a unique texture. It's a stylish way to support the right to fairness all humans deserve, and encourages the unity we need to get there. Handmade in California. Beautifully made and gorgeous to look at. I bought it for one of my employees and she loves it.